This weekend football fans across PNG will be treated to double the football fun at the second week of the Digicel Cup Elimination rounds. 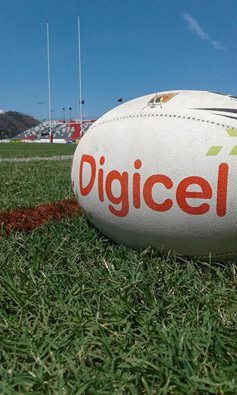 On Sunday, 21 August, Port Moresby’s Sir John Guise Stadium will be a hive of activity as four teams from across the country converge for a preliminary finals double header. The Snax Lae Tigers play the Wamp Nga Mount Hagen Eagles at 2pm, which will be followed by a second game at 4pm when the Provincial Government Enga Mioks take on the Agmark Gurias. PNGNRL Chairman, Sudhir Guru said the double header would provide football fans with great entertainment this weekend. “The Digicel Cup is such a well-loved event on the national sporting calendar and we wish all remaining teams all the best in this Sunday’s games,” he said. “The countdown is well and truly on now for the grand final of the 2016 Digicel Cup, which will be held at Sunday, September 4. “Digicel has been a proud sponsor of the Digicel Cup for the past six years, inspiring people from all over PNG to come together to cheer on and celebrate their local teams, Guru added. Tickets to the double header start at K20 for the outer stand, K50 for a grandstand seat and K10 for the car parking spots. Spectators are advised to purchase their tickets ahead of the game as limited tickets will be available on the day at the gate. Tickets can be purchased from Stop N Shops Badili, Central Waigani, Rainbow & City Pharmacy, Vision City. Those wishing to attend are advised to purchase their tickets from an authorised outlet only to avoid any inconveniences at the gate. Gates to Sir John Guise Stadium will open at 1pm on Sunday.